I have really enjoyed this series so far but this fifth issue was kind of disappointing. Each issue prior to this one has had a perfect amount of humor and action along with some heartwarming moments. This issue however felt like a filler issue with not too much of any of those things to satisfy me. The storytelling in this series has been great in my opinion. This issue doesn’t really push that story forward in any way. 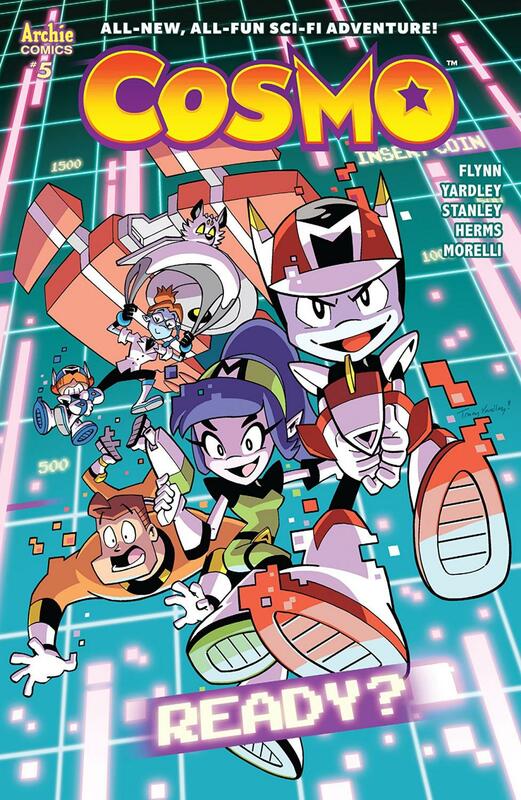 It almost feels like they really wanted to write and illustrate a scene where Cosmo is in a video game and wrote a whole issue around those seven pages. To add to the disappointment, the whole video game scene isn’t as epic as I thought that it was going to be. Despite my feelings on the writing in this issue, the artwork is incredible as always. All three artists and colorist do a great job at making each page absolutely packed with detail and color. Like I said above, I really missed the action scenes in this issue especially because the artwork in those action scenes have always been amazing. With this issue lacking those moments it also is lacking the artwork of those great action scenes that these artists have perfected in issues prior. I honestly want to write more about this issue but I really just don’t think that there is enough here to do so. The story doesn’t move much at all and the rest of the issue feels forced in an attempt to get this scene of Cosmo in a video game done. I have not lost hope at all though because the series has been great so far and I’m sure there will be more of those amazing issues that I have come to expect from this very talented team.